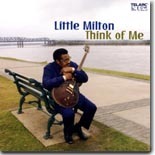 The great Little Milton is back with another wonderful disc, Think of Me. It's this issue's Pick Hit. A fine independent CD from Southern California artist Nelsen Adelard is this month's Surprise pick. We take a look back at some classic soul and gospel sides from the great Sam Cooke in this month's Flashback. This month's What's New section features new releases from Calvin Newborn, Otis Clay, Mem Shannon, L'il Ronnie and the Grand Dukes, Fathead, The Moondogs, Chris Cotton, and more, as well as a nice collection of contemporary African music from the Putumayo label.